Let's build this base together. I don't use photobucket, yet I see these on images from those who do. Is this a problem on my end or theirs? Theirs. It's an account issue, Photobucket changed their policy and are now requiring account holders tho upgrade to a pay tier in order to use them for hosting pics. I experienced the same so I using Flickr instead. VENENOR wrote: Theirs. 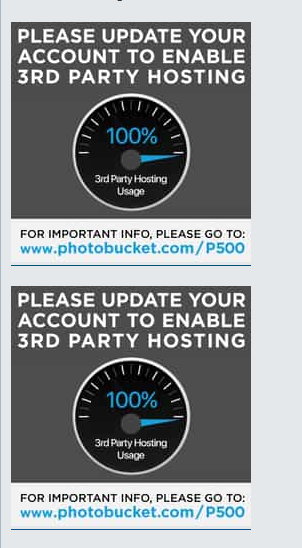 It's an account issue, Photobucket changed their policy and are now requiring account holders tho upgrade to a pay tier in order to use them for hosting pics. I experienced the same so I using Flickr instead. This almost makes me think a good rule on this forum would be to not use Photobucket, as it interferes with bst threads if someone forgets to renew their upgrade. The service was once free, but this was a recent change. The problem is clearly obvious now. I just post from instagram when it's personal pics and use the Glyos archive for buying pics. I don't sell as often though. NoPaintRequired wrote: The service was once free, but this was a recent change. The problem is clearly obvious now. I just post from instagram when it's personal pics and use the Glyos archive for buying pics. I don't sell as often though. Okay, showing my age here, but how does one hotlink from Instagram? This process only works on PC I should mention. After inspecting the page/highlighting the section I want to inspect, I find the hotlink to the image. I copy and paste that. That's my process. I'm sure there are other sites that let you get the image URL easier, but it's almost instinct.